The partnership has published the Final Report of the Hybrid Parks project. Please download your copy here or order a printed copy from the Lead Partner by e-mail. A lot of information, such as all reports and most of the presentations given, can be found on this website. 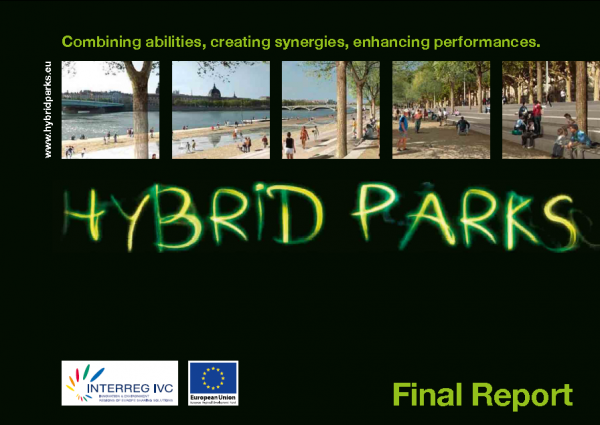 Future editions of the Hybrid Parks Newsletter will inform you about best practice transfer and regional implementation projects as well as about initiatives for joint European projects. Parks, both historic and modern, are intensively managed, high quality environments. They add to the attractiveness and success of cities and regions and to the quality of life for citizens and visitors. It is the project’s key objective that parks can fully be used for sustainable local and regional development and for policies to mitigate climate change by enhancing their abilities to better serve economic, social and environmental purposes; by combining the improved capacities to create synergies and to enhance performance and benefits; and by promoting guidance on how to relate the above with local and regional mitigation policies. Such policies ensure that in each park different functions work “hand in hand”. This can be compared with a hybrid car, where two sources of energy and engines are linked to use their individual advantages, to support each other and to enhance performance and sustainability. Analogously, the idea of “Hybrid Parks” came into being. The partnership includes many of those cities and regions energetically enhancing and using parks in a wider policy context such as economic development, rural diversification, protection of cultural heritage, landscapes and environment or urban renewal. Partnership also includes some “newcomers” which started similar policies recently. The partnership was brought together and inspired by the European Garden Heritage Network – EGHN (started as a project financed by INTERREG IIIB NWE in 2003), but includes many new partners as well. They all acknowledge the unique resources of parks, the advantages of cooperation and the need to achieve additional economic, social and environmental benefits to diminish the risks of decline or loss caused by conflicting demands, budget reductions etc. Climate change is a growing threat whose effects are not fully clarified. It will affect park features and plants directly. It will attract more visitors using parks as comfort places. Finally parks will be part of risk prevention strategies such as green corridors to mitigate climate change. Activities cover the 3 pillars of sustainability by individual and interrelated activities, based on experiences and resources of the partnership and the objectives of “Hybrid Parks”. Best practice studies include “Economy: Tourism and urban (re)development”, “Social: Widening the audience” and “Environment: Public awareness”. Policies using parks for economic, environmental or social development are investigated in two workshops each. Another six, cross-cutting or “hybrid” workshops investigate how to combine these approaches to increase the contribution and synergies of parks to sustainable development policies and mitigation of climate change. Study tours to the UK (focus: economy), Sweden (social) and Lower Austria (environment) and four open conferences further support exchange and transfer. This feeds into improved skills, policies and regional development plans, championed by regional support teams. The final conference presents the project report, with best practice case studies and the “Hybrid Parks Model” for integrated management of parks within sustainable development and climate change policies.